I grew up in Japan. Most of the time I was the only white person around. This experience taught me "Different is not wrong it is just different." 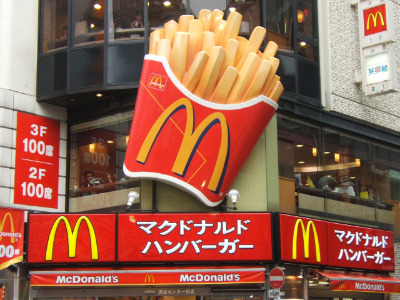 I remember one of our first trips to a McDonnalds in Japan. My dad ordered our food and we received one packet of ketchup for each order of fries. In Murica' we are accustomed to swimming in ketchup. Excess ketchup is basically a civil right. We like to smother our fries in ketchup. We are entitled to this gross excess because this is America! We are the customer. And the customer is always right! We were used to getting extra ketchup and taking it home. Our fridge had a bag of excess condement trophies from a host of restaurants that we would never use. These trophies documented our shrewd food conquests. We always ask for extra. It's just what we do. If we don't get a gross excess of ketchup from McDonnalds, then we got ripped off! This was my world view. Dad asked if we could have more than one ketchup per order of fries. They looked at us with shock. They said "No". My dad tried to explain that one packet could not possibly satisfy our condement needs. They looked at my dad like he had requested world peace and replied "It's just not possible". My dad spoke slowly thinking maybe this was a language problem. We just need another couple packets of ketchup. They asked exactly how many we would need. Dad generously responded we would make due with 5 more packets of ketchup. They disappeared to the back apparently having a short conference with management to discuss this extraordinary request. The cashier returned with the answer "I'm sorry. It is just not possible". We asked why and the response was if we gave you more ketchup then our inventory of ketchup to fries would be messed up. That day I learned that in Japan the customer is not always right. It felt like a slap in the face. I felt like I had been cheated. I felt like I was in crazy town and the whole world had been turned upside down. How could they be so WRONG? How could they not see we were RIGHT!? This was the beginning of an education. Over the years I learned that Japanese do many things different than Americans. I love heated toilets. I'm drinking green tea from a traditional Japanese cast iron tea pot as I write this. I can't stand what passes for rice in America, and I drive an hour to Pittsburgh just to get a good bowel of ramen. I miss sleeping on the floor. I miss the convenience of riding the train. Part of me is Japanese. I'm so thankful for the friends I made, and the rich culture of Japan I experienced. Different is not wrong it is just different. Sometimes different is better. Sometimes different is rich and nuanced. Sometimes different is just different. We have to examine ourselves for cultural bias. Because it hides. I'll speak to this in the next post. What cultural biases have you been able to identify in yourself? Let me know in the comments.